Our windows SSD web hosting is perfect if your website is built for ASP/ASP.NET and you need to use an IIS based server. You get all the standard windows features included like application pools etc. and can also addon MSSQL databases to use with your web hosting when required. Economical windows hosting suited for starter websites needing Windows IIS services. Built for active websites & provides plenty of resources for hosting your existing windows project. Ideal for websites built on ASP, ASP.net that need the resources & power for a business website. 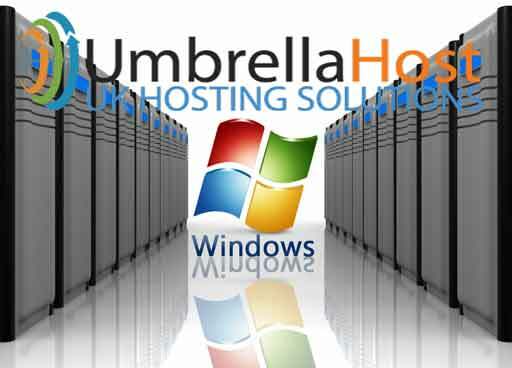 The Windows shared web hosting plan by Umbrella Host comes with all the features you need to get your site up and running fast. The only difference in our shared Windows hosting plans is the amount of domains, disk space, bandwidth and MySQL databases that you require. Everything else is included as standard. Is MSSQL database included? Why is there an additional cost for MSSQL? Is ionCube supported? How do I setup an SSL? Will your prices change? No, our windows web hosting works off MySQL databases rather than MSSQL as standard. However if your website requires the specific use of MSSQL databases the these can be purchased as and addon for £12.99 p/m. The additional cost for an MSSQL database covers the costs of the Microsoft licensing fee that’s applicable for a 1GB Microsoft MSSQL database. ionCube is currently unavailable with our Windows Shared Hosting plan. If you require this feature and your website is coded via PHP rather than ASP/ASP.NET then we recommend you choose one of our Linux hosting plans instead..